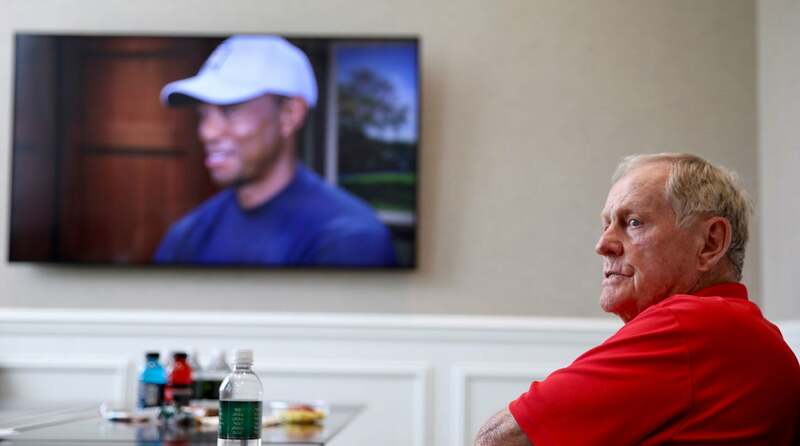 AUGUSTA, Ga. — Leaning back in his leather chair, eyeing the Masters telecast on a wall-sized TV while waving around a Moon Pie, Jack Nicklaus appeared to be just like any other golf fan on Thursday afternoon, save for his green jacket folded discreetly on a chair in the corner. He had consented to an interview in a private room within the press building at Augusta National, but that ended half an hour ago. Now Nicklaus was hanging out, sucked into the Masters just like the rest of us. At 79 his stamina is remarkable: he had been up before dawn to smack the ceremonial first tee shot; weathered a joint press conference with a blustery Gary Player; schmoozed for a couple of hours around the clubhouse; and then spent more than 90 minutes discussing his life and career in forensic detail. Claiming he had never before enjoyed a Moon Pie, Big Jack studied the list of ingredients, the calorie and sugar information and agreed to taste-test one. Meanwhile, on the TV, Rory McIlroy pitched long and right of the flag at 18, leaving a 5-footer to save par. Nicklaus claims not to watch much golf but he doesn’t miss a thing. He maintained a steady dialogue about the play as it unfolded on the telecast. Is he now just a casual fan or does he still view the golf through the lens of a competitor? Cameron Smith alighted the screen, hunched over a putt. “Is he the one who looks like he’s 12 years old?” Nicklaus asked. The camera caught Smith retrieving his ball from the cup, looking like he’s 12 years old. Six-time Masters champion Jack Nicklaus had a wide-ranging conversation with Alan Shipnuck during the first round. With the slightest touch of braggadocio, Nicklaus recalled that in 1964, when he was by far the game’s longest hitter, he needed only an 8-iron to knock it on the 15th green at Augusta National. Now half the field can do that. Nicklaus revered Bobby Jones, felt a deep kinship with Augusta National co-founder Clifford Roberts and maintains a strong affection for the club and the tournament it conducts. But he also has a clear-eyed view of things. Jack, would you like pimento cheese sandwich for a snack? He scrunched up his face and said, “Noooooo.” Instead he cracked open a bag of caramel corn. Nicklaus is hopeful that Augusta National chairman Fred Ridley, a former U.S. Amateur champ and reputed course architecture wonk, will take the course back to its origins. He recalled a conversation with Ridley’s predecessor Billy Payne. “I told him Bobby Jones’s philosophy was that this is a second shot golf course,” Nicklaus said. “What do you mean?” Payne replied. “He still didn’t understand it even after I explained it to him,” Nicklaus said. Nicklaus was flying home to Palm Beach on Thursday night. He was going fishing the next day and said he probably wouldn’t watch more of the Masters until Sunday afternoon. He already knows how every putt is going to break. Up on the TV screen, McIlroy stood over his par putt at 18. A dollar had been wagered on the outcome. Just as Nicklaus predicted, Rory failed to play enough break and missed on the low side. A dollar bill was slid across the table, then returned to its sender.